This week’s league fixture was a rematch of the previous week’s cup encounter against Kendall Wanderers C. The game was played on a warm, sunny day at Ceylon Park in Dorchester. Despite the change in venue, the result was similar, with BCS ending up 4-1 winners. The away team got off to a strong start, opening the scoring within five minutes. Darren started things with a through-ball to Marco, who did well to wait for support and slide the ball across the box to Adam, who fired home from close range. As the half continued, the weather began to take its toll, with both teams looking tired and the level of play somewhat deteriorating. BCS created several more half-chances, but nothing clear-cut, and the half ended 1-0. In the second half, BCS XI’s strength in numbers seemed to pay off as their substitutes helped keep legs fresh. Stu took control of the midfield, and helped create the game’s second goal. He fought for enough space to release Marco with a through ball, whose touch and speed helped him separate from the Kendall centerbacks before coolly slotting past the keeper. It was a critical goal to help settle the tie, and well worth the yellow card he received for excessive celebration. Stu was involved again soon after, heading in the third goal off a long throw from Andy Hoot, who himself did well to win a penalty but then blazed it over the crossbar. Then, to round out the scoring, Adam scored his first brace for the club, exceeding his goal production for the entirety of last season. Despite the 4-0 hole, Kendall kept their heads up and pulled a goal back, finishing from a tight angle at the far post to make the final score 4-1. 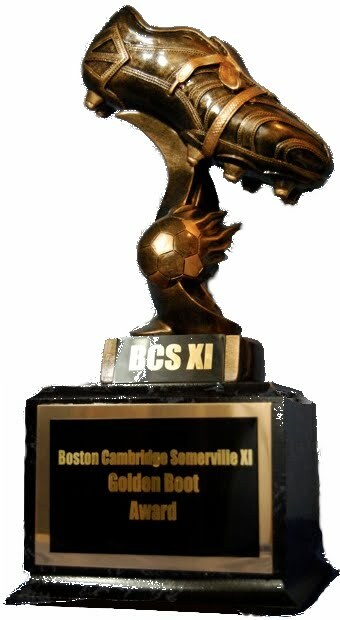 BCS XI next take the field in league action against Independiente on May 14th. The game will be played under the lights at Charlestown High School.